World leaders will meet in Geneva next week to start negotiating a new international law to ensure companies respect human rights and the environment in their global operations. But a lack of support from European governments is putting this vital United Nations treaty at risk. Every single day, human rights abuses and environmental damage caused by corporates make global headlines: from indigenous communities displaced by palm oil plantations in Indonesia or biofuels in Guatemala; to workers exploited by mega-projects in the Gulf region and the mining sector in Africa. Victims of these abuses, especially women in marginalised communities, are nearly always left without access to justice or effective remedies. Those who speak out can face threats, arbitrary arrests or even be killed. When they succeed to file a complaint, they generally see their claims rejected – sometimes after ten or fifteen years of fierce judicial battles. The courageous complainants with scarce financial resources are fighting an unlikely battle against giant companies supported by an army of lawyers. That is why we need this UN treaty – which will be a legally binding international convention that will define companies’ human rights obligations and guarantee victims’ rights – to address this huge power imbalance. One would naturally think that because the European Union is founded on the fundamental values of human rights, justice and the rule of law, the EU and its member states, would support that agenda and work to ensure that the treaty will be effective in protecting the human rights of people affected by corporate abuse. But in fact, the opposite is happening, and the EU is hampering progress on this vital treaty. EU member states not only voted against the decision to start the negotiations in 2014, but have since obstructed the negotiation process. Our governments argue that respecting human rights may affect the competitiveness of European companies. In a misguided effort to protect European companies’ competitiveness, they are ready to launch a race to the bottom, exploiting workers and destroying our planet. With the exception of some encouraging first steps taken by French legislators, our leaders appear to consider voluntary approaches, whereby companies themselves decide which rules to follow, to be good enough. In fact, the Brussels institutions and many national governments in Europe are assuming that what is good for big business is good for all, the main argument being that these companies create jobs. This is exemplified by the EU’s support for the system of out-of-court settlements that allows companies to sue governments adopting measures that may be in the public interest, but that affect their projected profits. While the EU is so far unwilling to establish strong rights for victims of corporate abuses, it is doing its utmost to strengthen enforceable rights for companies and investors. This is short-sighted, flawed and dangerous. The expansion of unregulated international trade and globalisation encouraged the emergence of global ‘value chains’ dominated by very large companies, built on the use of a cheap and unorganised labour workforce in the Global South. This model whereby women are concentrated in the lowest paid and insecure jobs has made jobs dependent on a few, super-powerful economic actors and devastated countless micro, small and medium size enterprises in Europe, who can’t compete with low labour standards prevailing in many countries. By stubbornly continuing to consider that the interest of those super-large companies equals public interest, our governments have produced inequality, climate change, and the conditions that have bred nationalism, populism and racism in Europe. It is time to regulate the large companies that have become so powerful that they have excessive and devastating influence over national and international public policies. The list of regulations they have already defeated at the expense of people and planet is endless. They don’t want chemical pesticides to be prohibited, they don’t want to be obliged to report their tax payments so they can keep avoiding tax and they want our governments to keep investing in fossil fuel. The list goes on, as remarkably evidenced in a recent Alter-EU report. On Wednesday, the Working Party on Human Rights of the EU Council will decide whether the EU will participate in the event in Geneva next week. If they don't attend they won't have a negotiating mandate. The Geneva meeting is a unique opportunity to avoid a race to the bottom between companies from rich and emerging countries. 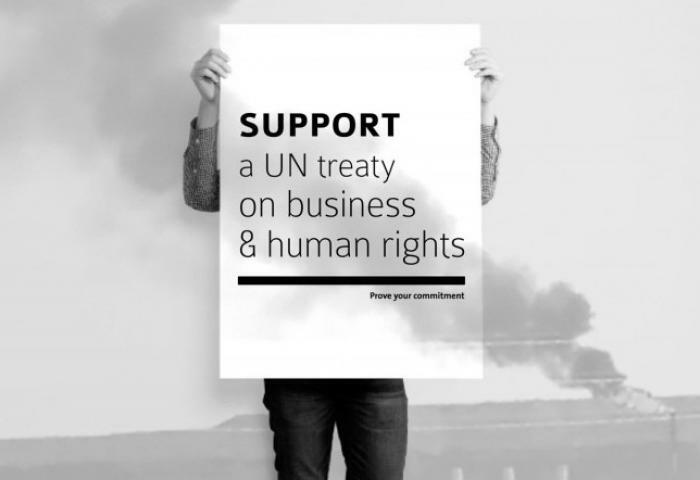 Rather than stalling the negotiations, raising derisory procedural objections and calling for companies to sit at the table to contribute to the negotiation of the Treaty, the EU and its member states should use all their skills and experience to reach agreement on this vital step in preventing corporate human rights abuses. Neelanjana Mukhia is head of global engagement at ActionAid International, and Paul de Clerck is coordinator of the economic justice programme at Friends of the Earth Europe.